I just stumbled upon the forum here today. It's good to know that Klipsch has an officially sponsored community. I'd like to bounce a small dilemma I have off the forum and gather some opinions on the subject. I own an RSW-10 which was purchased brand new almost three years ago. This is remarkable being that the subwoofer has been out of production since 2008. Imagine my surprise when I found one of these beauties brand new and still unopened four years after it had been discontinued. You ready for the punchline? I only paid $400 bucks. I came home one day last month to find that my RSW-10 was producing no sound whatsoever. My wife explained that one of our young nephews had accidentally turned the sound all the way to the max on the subwoofer and there was an audible "pop" just prior to the driver's demise. They were watching Transformers II. Enough said. After digging into the unit I determined that the amplifier section was operational and that, in fact, the 10" driver was dead. Good gosh this driver is a thing of beauty... but right now it's just a beautiful paper-weight. After providing my purchase information, Klipsch has, rather amazingly, decided to honor my warranty. They have agreed to replace this unit with an SW-310 after I send them back the broken RSW-10. Obviously the driver is no longer being produced, so they can't just send me a new one. So after checking out some of the reviews and specs of the SW-310, one could imagine why I'm a little less than enthusiastic to give up my RSW after just getting to know her. So then I thought about simply replacing the driver with a quality one from Dayton Audio. 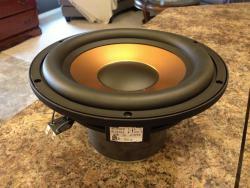 The driver I'm considering is a Dayton Audio, part number: RSS265HO-4. They have one which appears to be pretty much spot on to the Klipsch original. The cast aluminum frame of the driver appears to be identical, even down to the six-hole configuration. The specs appear to be in line, and for $140 bucks, I could have a near exact match for the driver ... minus the black anodized cone of course. So, what to do? This leaves me to either wait for a "used" Klipsch RSW-10 driver to show up on eBay one day, take Klipsch up on their exchange offer, or buy the Dayton audio 10" driver. What would you do in my situation? Any thoughts on the notion? In the meantime, I have temporarily replaced the damaged subwoofer with an RW-12d that I found on Craigslist for $175 - in mint condition. It's just not quite the same. The RSW-10 has more depth and a lot more dynamic power than this RW-12d, and, I would imagine, a lot more to give than the SW-310. Without knowing the TS parameters of the stock woofer, it's impossible to tell if the Dayton would work. 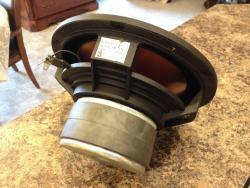 I'd look for one used or call someone like Simplyspeakers and see if yours can be repaired. How did you determine it was dead? Check it with an Ohm meter? Absolutely. Multimeter reads zero at the 200 Ohm setting. I also have an 8" woofer I connected to the amplifier just to make certain it was working. I'm guessing that one of the leads woven into the spider broke. It's hard to imagine the voice coil going out on one of these things without causing damage to the amp. Is it smooth when you push up and down on the cone or does it feel rough? Any burned electrical smell at the spider? 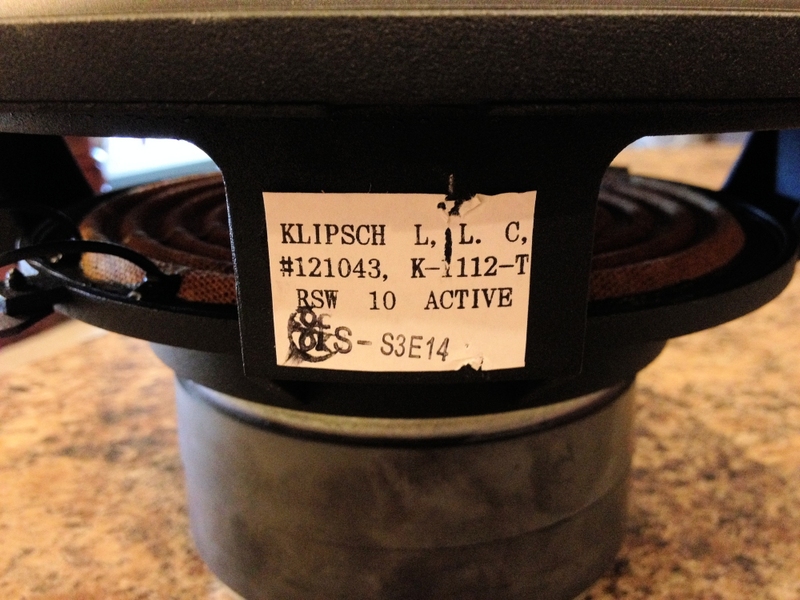 fter providing my purchase information, Klipsch has, rather amazingly, decided to honor my warranty. That's why we love our Klipsch. They have agreed to replace this unit with an R-110SW after I send them back the broken RSW-10. Obviously the driver is no longer being produced, so they can't just send me a new one. So after checking out some of the reviews and specs of the R-110SW, one could imagine why I'm a little less than enthusiastic to give up my RSW after just getting to know her. There is a chance that the RSW10 is a better sub than R-110SW but I have no way of confirming that. In this order, I would first ask if Klipsch would consider the R-112SW as an even exchange for your RSW10. If no to that, ask Klipsch how much more $$$ plus your RSW10 for an R-112SW. Then ask the same question for an R-115SW. If none of the offers are to your liking, then wait for an RSW10 driver to pop up on Ebay. You could also call HERE or HERE and check on a repair. Hold the phone, guys! 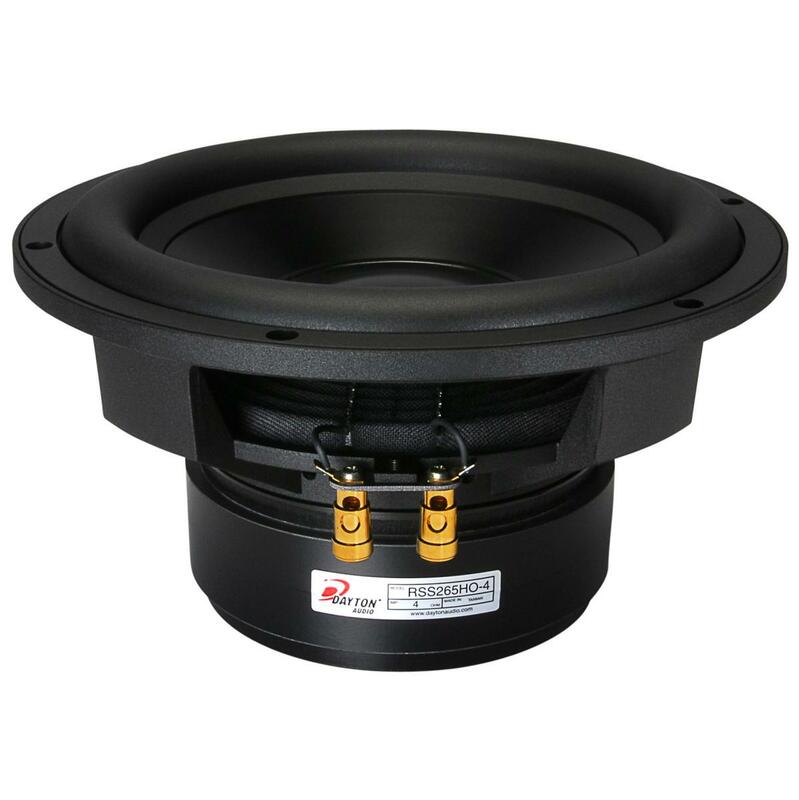 I stated the wrong replacement subwoofer in my original post. My apologies. Klipsch stated they will replace my RSW-10 with an SW-310, NOT an R-110SW. That's a huge difference right there. Getting old stinks! Anyone else get confused with all the different model numbers? Anyway, the SW-310 has had favorable reviews ... and some not so favorable. Sorry for the confusion. I've edited the original post to reflect the correct subwoofer. It has no scratching sound of a burned VC, if that's what you mean. It's very smooth. No burned smell of any kind. Also, there appears to be no re-cone kit available for the cerametallic drivers. Ah, So you're the one who snatched that subwoofer. You got it fast. I had been texting with the owner then was informed it had been sold. If you decide to part with the RW-12D, let me know. Obviously the game has changed a bit after realizing my mistake. I'm not familiar with the SW-310 at all, so I'm not sure what it stacks up against these days. Yeah ... that'd be me! Now if I had the extra money I'd have bought his RF-62's as well. If I recall. I believe they were RF-82's. Last I saw he was asking $475 for the pair. Someone must have finally bought them since they disappeared. I'm of the school of "if it's broke, I can't make it any worse". If the voice coil is OK, I think I'd try to remove the dust cover and see if there's anything there that could be repaired or reattached. It specs out better than your old sub. You are correct. They were 82's and I think they eventually sold for $375 after being on the list for about 10 days. That RSW-10 was $1300 retail when new. Your $400 find was pretty nice. You've used it (not sure for how long) and now you can get a brand new $500-600 (street) Klipsch sub for the price of shipping, maybe $100. That's pretty nice too. The real question is, can you get a replacement driver that would equal the sound quality of the original Klipsch, and for how much? My answer is "I don't know." I think the safe bet would be to take the new one. But what if you could UPGRADE the old one for a couple hundred bucks? I would get a second opinion. The folks over on AVS.com are real knowledgeable on sub drivers. Many people here are also members there. Try asking your question on the DIY Speakers and Subs Forum to see if that Dayton Audio driver would be the best replacement driver for your Klipsch. Thanks to everyone for the warm welcome here! That's some "sound" advice there, WVU! I appreciate that. Yeah, I couldn't believe my eyes when I found that RSW for the price I did. Turns out that an audio dealership was closing its doors due to a death in the family and they were liquidating their stock on hand. Maybe an Atlanta forum member can help you out.